My Magnum Opus - A Train No Less! So here is my Magnum Opus - yes it is a locomotive, from a bygone era. This loco was designed by Robert Stephenson to replace the outmoded reciprocating steam engines of the Victorian Era. Sadly this locomotive never made it to service, but it is believed that it was secreted into a hidden tunnel somewhere on the UK rail network and sealed up, never to be seen again - maybe not! 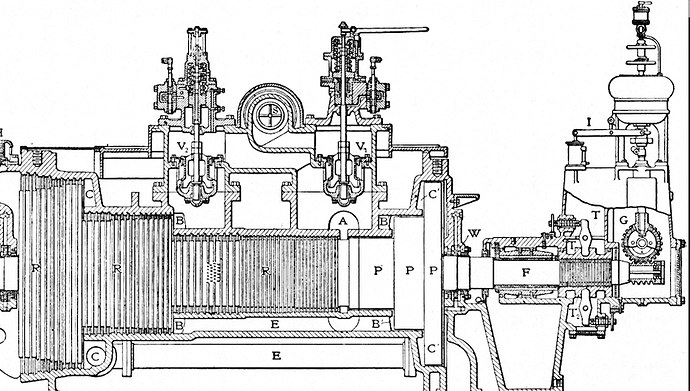 The reason this technology never made it to daily operations, is not because the Victorians decided not to hand it down to us for fear of us misusing it - the common assumption, but because the patents were all bought by a major oil company, through a series of deceptions, underhand practices, etc. and shelved so that they could continue to make huge amounts of money out of burning fossil fuels. 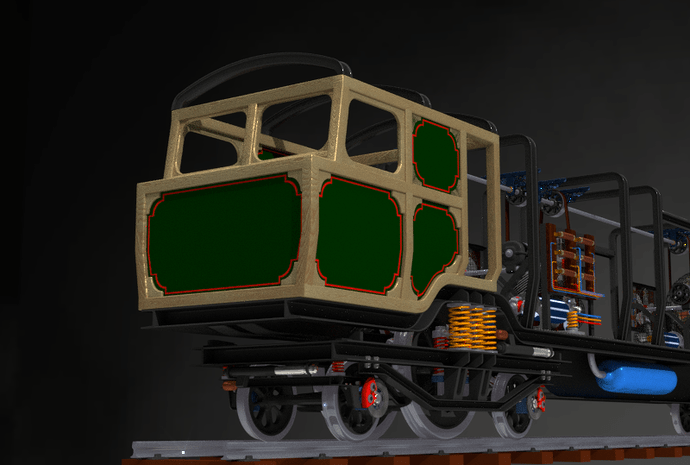 Fortunately, after I learnt of the existence of the loco, I was able to commission a “friend” to break into the vaults of said oil company and steal the patent drawings for most of the parts of this intriguing machine. UPDATE - Picture changed for more up to date version. 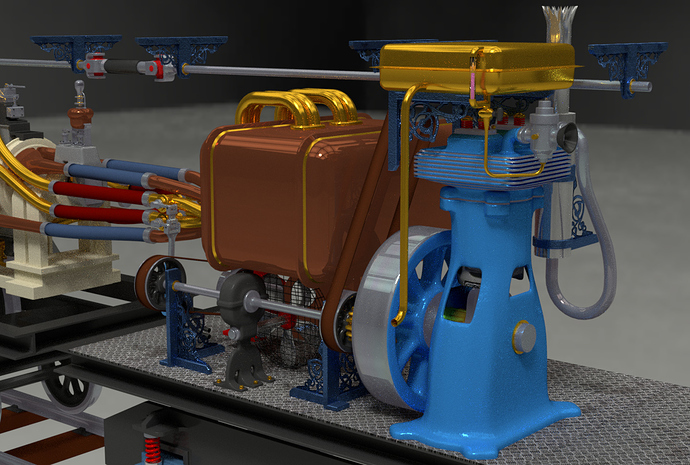 Showing the front bogie and drive motors. I am just “blocking out” at this stage to get the overall feel of each piece. I will return over the coming months to each mesh and refine it, along with much more detailed texturing. 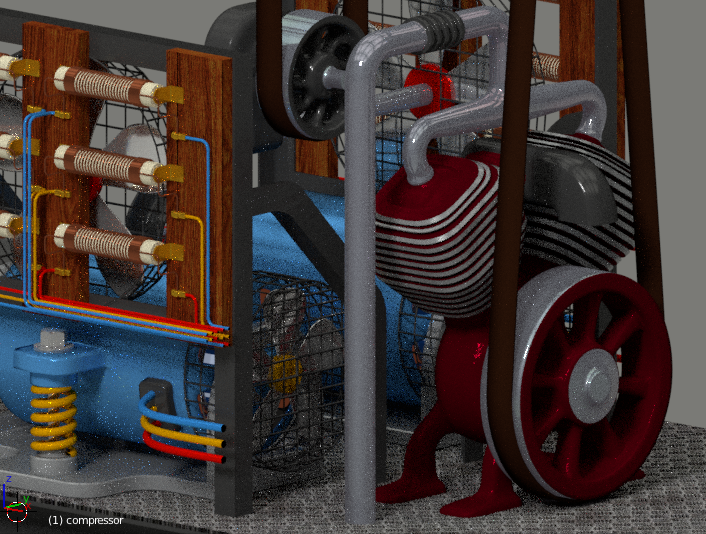 The flexible pipes coloured red and blue convey the high pressure gas to the turbine and return it through a forced-air condenser to the boiler, where it is reheated, re-pressurised and reused. You can make out the gas induction “Thromulators” in this image, these are located on ether side of the brass inlet pipes and control the pulsing of the gas into the turbine for maximum efficiency. You can also see the “Necromatic Lubrication Modules” at each end of the turbine, these have the small copper pressure stabilising chambers and relief valves on them. From a Blender point of view I should say that every thing on the model so far is fully rigged and operational, including all the motors, driveshafts and transfer gearboxes, the loco is also rigged to travel around a curved track. 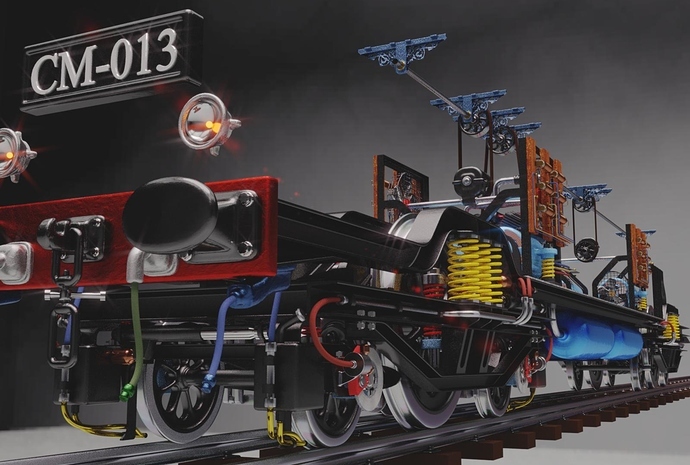 The drive motors have torque-reaction damper springs to stop damage to the loco caused by the immense power they have. These motors are of the “Rotating Magnatronic Pulse” variety - lost to us from Victorians times, but similar to a modern brushless AC induction motor. 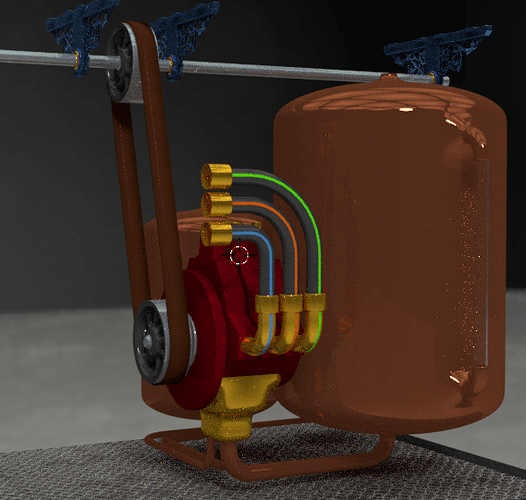 You will see banks of resistors above each traction motor - these are for braking - any motor of this kind can be slowed by simply connecting a low resistance across any two of the three input wires to the motor - much like your typical radio controlled car of today. I have also discovered that “gas compensated, oil filled motion dampers” are nothing new, there are some already on the bogie, but more need to be added. As befitting the will of the Victorians, the gas balance chambers on these are made of copper. So here it is - despite the best efforts of the fossil burners to stop this marvellous technology, I aim to reproduce this loco in all its glory over the next - probably year, I think. Again any help with the technology, where I cannot find the details off the stolen drawings, would be gratefully received. 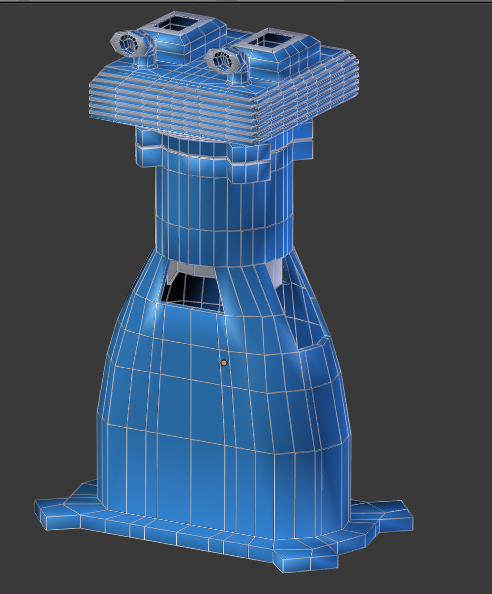 I know a lot of this looks like a plastic toy for now, but I will be doing all the materials in greater detail later on. 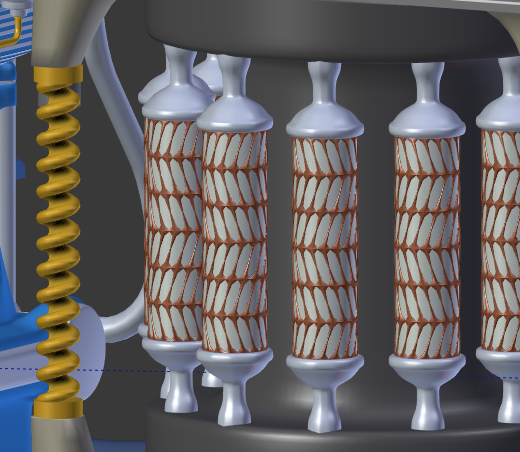 I have also to model the carbon brushes for the generator, and wire it up as well. The pink fuel will glow, once I spend some time on the compositing. 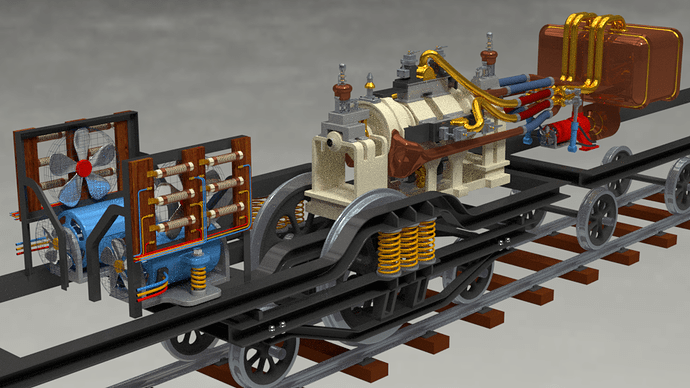 I need to look at some more details on the donkey engine, particularly its carburettor and valve gear - these are not finished yet. Hi Clock, when I read your opening post the first time I thought you were joking. But then I did some research and learned that this machine did exist really. There isn’t much to find on the internet, though. Where did you find your references? You started a true opus magnum, indeed. … Where did you find your references? 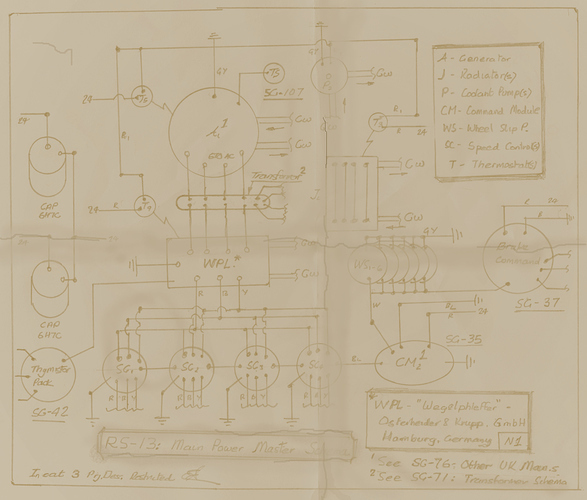 So my reference material came from patent drawings “borrowed” from the major oil company as described in my first post, I also have other sources that I will go through later on. The Railway Technical Centre, as was, no longer exists, so I have no idea where the plan chest went. 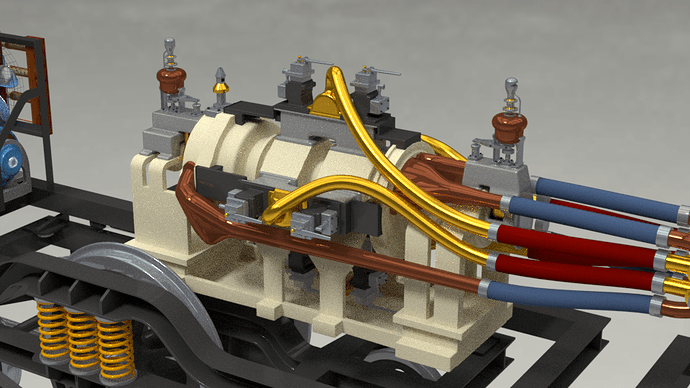 On the wiring diagram there is a device called a “Wegelphleffer” that has wires going into it from the transformer and wires going out to the four traction motor speed controllers. This was manufactured by Osterheider & Krupp GmbH of Hamburg, Germany. I don’t have a drawing for it as yet, but it may be in my papers somewhere, so I cannot describe it in detail. 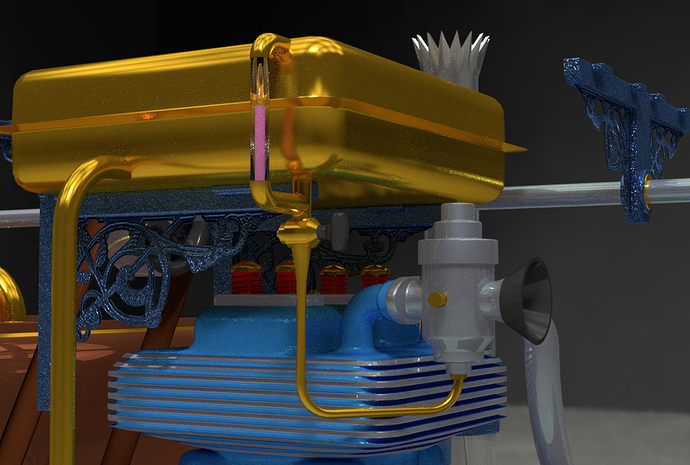 It is liquid cooled, as is the transformer, and the cooling system for both parts is connected to one radiator. So… I am wondering if you know what this might be and what it might look like? It’s a long shot I know, but I thought I might just ask. I thought it might be a rectifier, but he german word for that is “Gleichrichter” or “Stromrichter” I think - so I am not sure what its purpose might be. First, thanks for your explanation. Now I know where your love for trains is coming from. “Wegelphleffer” does not sound like a German word. I did a search for it and also for the mentioned company, but I didn’t find anything. I pm’ed you my e-mail address. Maybe I can have a look at the diagram? OK, thanks for that @minoribus, I have sent you a mail. 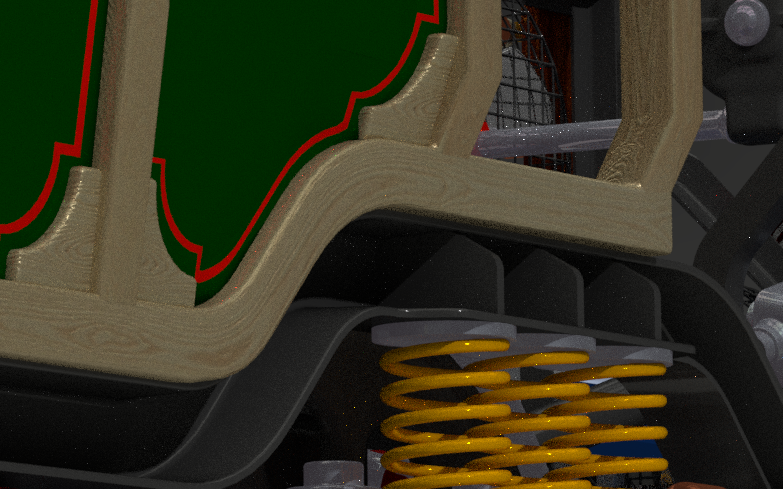 In the meantime, I have blocked out the compressor, this provides air for the mechanical controls, brakes, etc. It was supplied by Pankhurst & Rimmington Internal Combustion of Kidderminster Ltd. - The pneumatic actuators for the gas valves, other pneumatic parts and fittings etc. were supplied by a World leader in pneumatic control systems during Victorian times:- William Arthur Norris Kinematics Ltd. of England. This compressor is powered by the overhead power shaft - driven by the donkey engine. Unfortunately my research didn’t reveal anything about the mysterious Wegelphleffer. Would be interesting if someone else could shed some light on this. unfortunately some of the drawings are notated in Latin (Bloody Smartarse Victorian Engineers) and I cannot decipher what the three chemicals required for the reactor are. The first one is a bright orange in colour (I have a coloured drawing of the reactor), the second is a lightish blue (maybe there is Phosphorous in it?) and the third is lime green - eek!. What are the names for the chemicals in the drawing? You can see the colour coded hoses, but the tank measure glass is empty just now - the big tank will hold the orange coloured fuel. The other two smaller ones are hidden just now. I have to add much more detail to the tanks, but I just wanted to get them in to see how they fit. PS. Thanks @minoribus for the nice comment about the modelling, there is much more detail and materials work to do, that will keep me very busy once I have everything basically in place. It was originally developed by the Patterson Institute for Serried Sciences & Energy Development and then taken up by Fosdykes to build, as I described in post #1 I think. I have much, much, much more work to do here… :eyebrowlift: I may well leave this for a little while until I have the other major components in place. I have just realised that I have to UV map the turbine - I think that might take a while too!!! That is an explosive mixture, I guess, but I’m not very versed in chemicals. The lens stars on the fluid containers are a nice effect. Did you add them in the compositor? BANG! 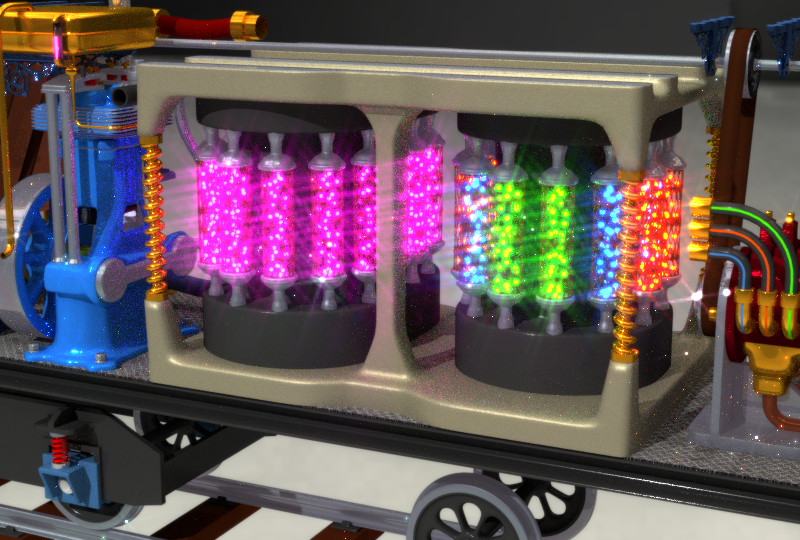 - just joking… The chemicals are allowed to “fester” in the first stage of the reactor (12 chambers) before being combined in the second stage (16 chambers) - were the purple colour appears - the plasma couples are not in place yet to trigger the reaction, so technically the image is not correct. Also the Graphite-Strontium rods are not shown yet, without these the reactor would go into uncontrolled fusion and explode taking the loco and the surrounding 3 miles of countryside with it. 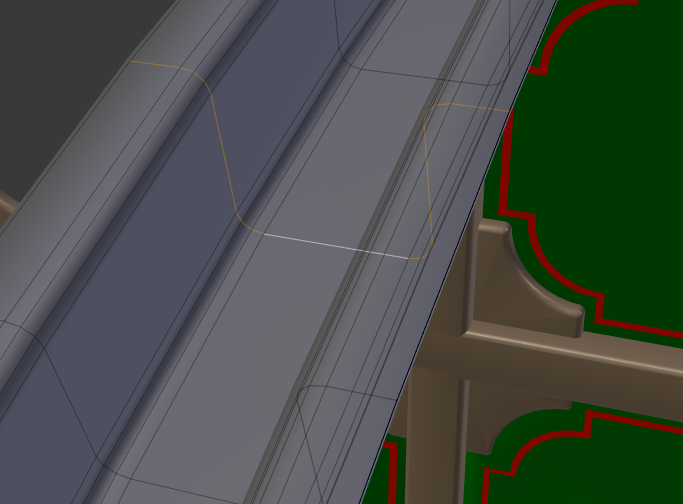 You should be able to see the section, I have used a Solidify Modifier to get my thickness. It will be easy to rivet the outer plate to this. In my days at BR I used this section extensively to make carriage and loco bodies, only then we welded the outer plate to this section rather than rivet it. I guess Aveling-Roe were ahead of their time… :eyebrowlift: I did not see this section in use before the 1960’s in the old drawings I looked at. The sign writer also had a go at doing some coach-line work, I may have to employ another artisan, since I am not sure about this method just yet - I have still to discover, in the paperwork, who the original painters were. I know that the loco would have been hand painted with very slow drying coach enamel applied with a long bristled brush - a skill that I suspect is also long gone with the generations younger than me. I’m a little worried about the use of Thromulators in this application; isn’t there a risk of resonant coupling leading to runaway thromulation? The necromatic lubcrication may help with dampening, but I’m sure you know that already. Yes, thank you for pointing that out, you are quite correct in what you say. 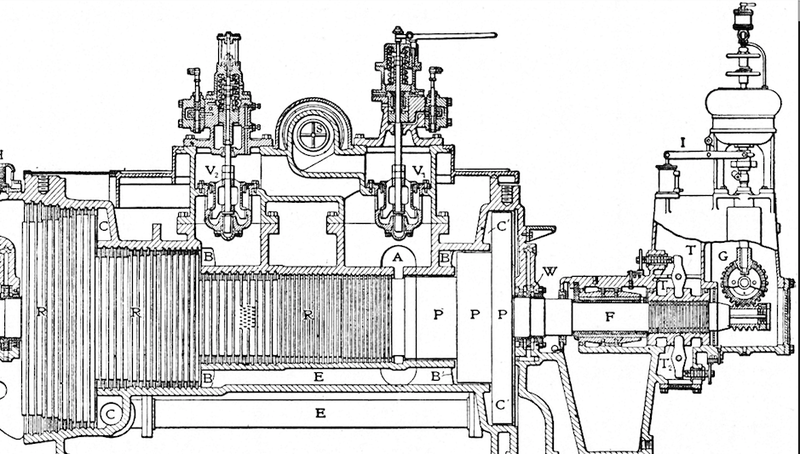 Resonant coupling is a major cause of over-thromulation on all high pressure gas turbine engines in Victorian times and is still a concern today. This condition, in the end, leads to catastrophic failure of the turbine gas inlet re-flanging mechanisms and thus destroys the turbine. So in the case of this loco, there was a very effective Engine Management Unit (EMU), built using Valves, rather than transistors or silicon chips, that I have still to add to the loco. Personally I would not even try to run this engine without the Thromulation Resonant Coupling Debigifier (TRCD) module of the EMU in place, also I would never rely on just necromantic lubrication to dampen out the problem. Thanks for you very wise and valid input. 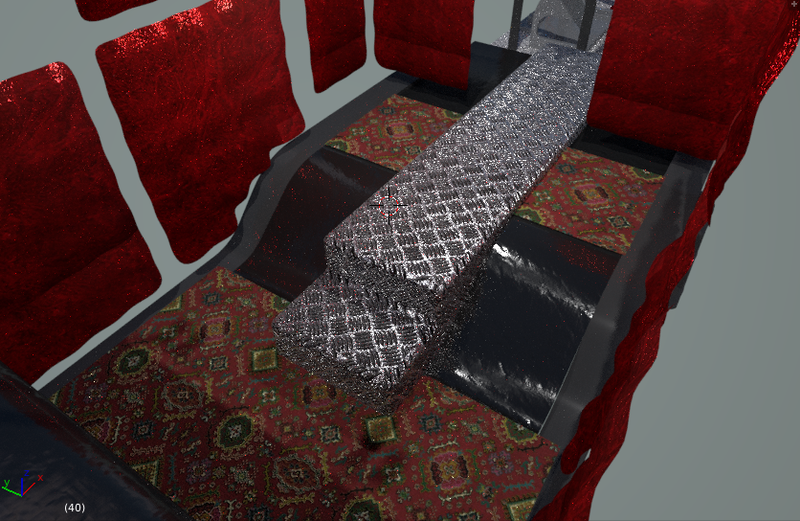 I have also worked on the materials for the panels, adding some displacement in the node structure. Same applies to the roof panels, but I haven’t added the rivets yet. 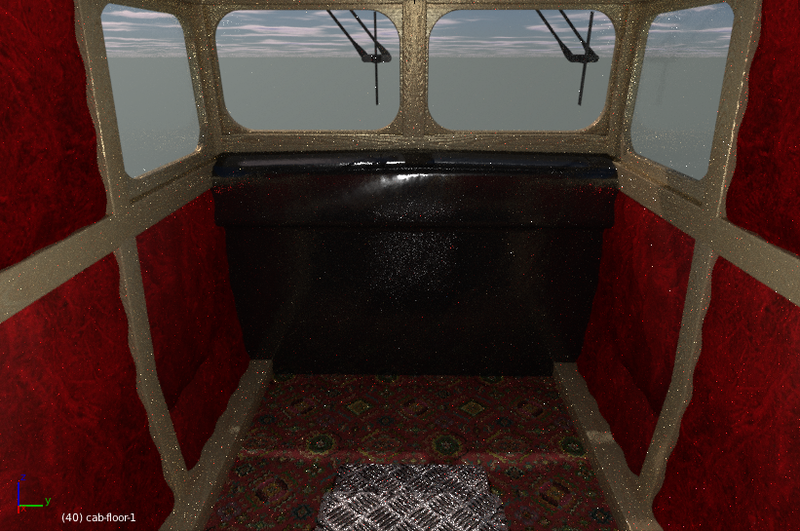 I will start work on the inside of the cab, a little, to get the feel for where things go. A very, very interesting project indeed! How lucky you were, to have worked on the railways. Personally I would not even try to run this engine without the Thromulation Resonant Coupling Debigifier (TRCD) module of the EMU in place, also I would never rely on just necromantic lubrication to dampen out the problem. Your knowledge on this is impressive. As I understand it, TRCDs were classified Highly Secret by the Ministry Of Railways And Canals to prevent the Germans (or even worse, Americans) getting hold of this technology; as such any plans had to be kept in a locked bureau away from the eyes of wives and servants. It’s wonderful that the information has survived to this day so you can incorporate it in your design. 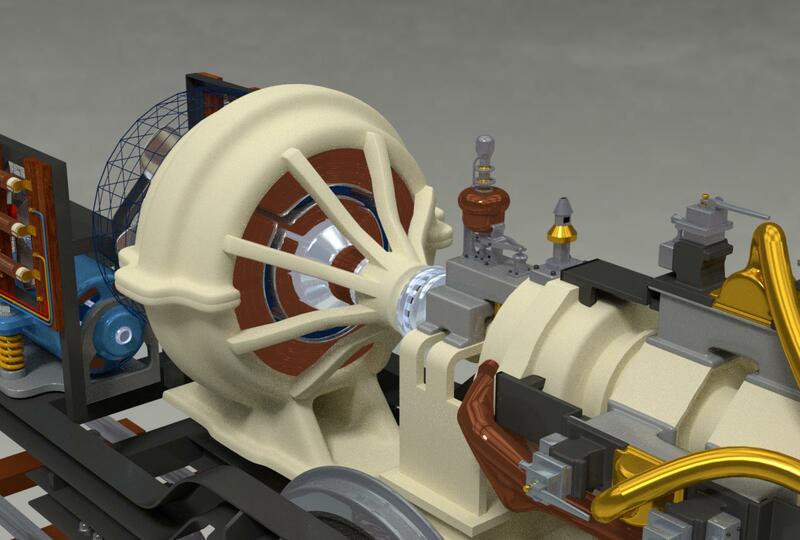 I look forward to finally seeing an EMU with an integral debigifier! A more general question; have you chosen a particular livery for your locomotive? 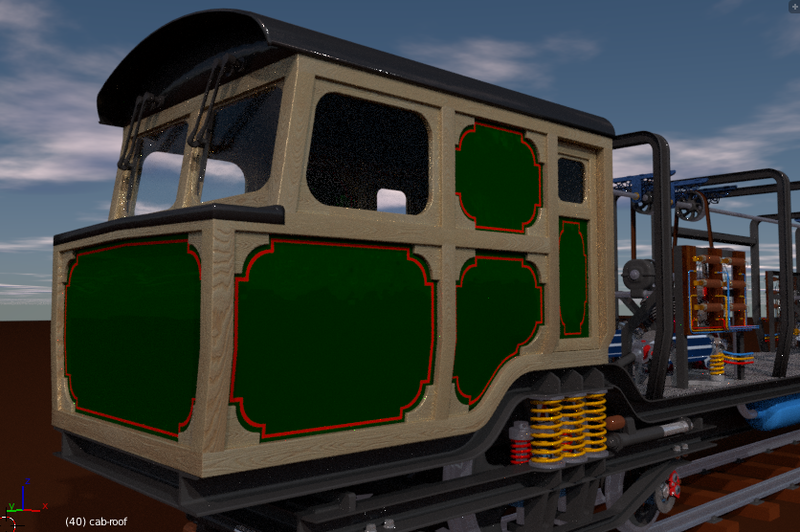 On the livery side, the loco had its own livery of dark green, red coach lining and black underframe, etc. On the matter of the Thromulators, yes indeed the papers were highly secret and were not to be shown to wives, servants or mistresses (a mistress is defined as “that which comes between master and mattress” ). I was reasonably sure of how they worked before I started this project, but I found, in my “borrowed” paperwork, an academic research paper by Emeritus Professor Josiah Pendleton-Smythe, principal of the Telford University Research Department on the matter and he seems to confirm what I already knew from my days working in this field, along with adding some more detailed and theoretical info I wasn’t aware of. I will be building the EMU in the next week, I have to sort out the electrical systems and I still don’t know what the “Wegelphleffer” does or looks like.